All PortionPro Rx Parts that come in contact with pet food detach easily for cleaning. These should be washed before first use. Note: Hand-wash with mild dish soap and warm water less than 165°F. Dry all parts completely after cleaning and before assembling and filling your PortionPro Rx. We recommend using a compressed air can as a quick and easy way to remove dust and small debris such as kibble. Manually open the food bowl door by holding both and at the same time for 2 seconds. Lift the food out of the food bowl receptacle using the grip tab. TIP: Put the PortionPro Rx in stop mode after you remove the food bowl and before you begin cleaning. For STOP mode, follow the steps on page 16. - Squeeze finger grips and lift up on the food bin lid to remove it. - Pour any food left in the bin intro a container. 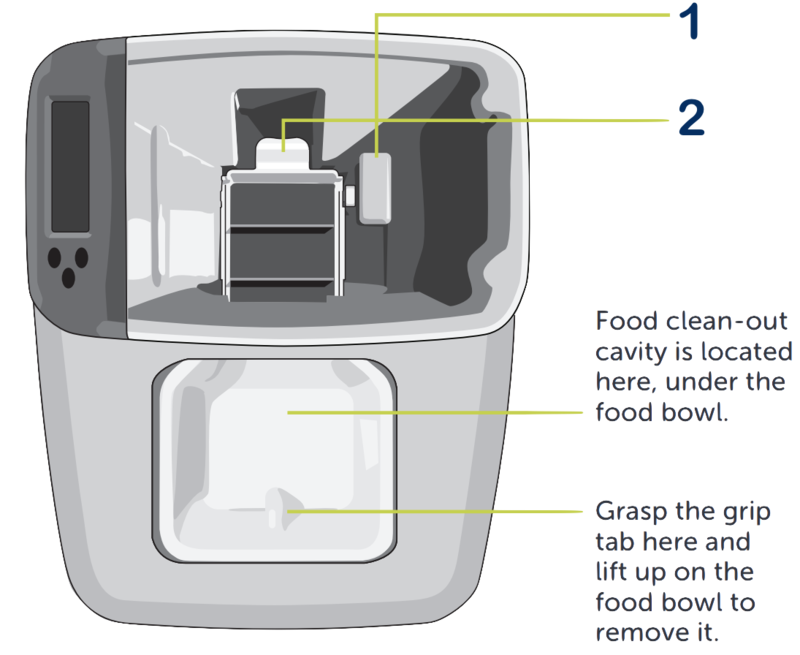 - Grasp the food bin at the corners that adjoin the control panel and gently pull up and away to separate the bin from the feeder base. Press and hold button 1 while lifting handle 2. Gently but firmly pull the food belt system from the feeder base. - Hold the food belt system in one hand and grasp the bottom of the triangle-shaped end 3 in the other hand. Gently pull the sliding bottom panel down and out. - Thoroughly wash and dry the food belt system. - Replace the bottom panel on the food belt system by lining up the bottom panel with the tracks on the belt cartridge and sliding it back in until it clicks. Make sure that all tracks are properly aligned before replacing the food belt system in the feeder base. - If needed, use an old toothbrush for removing stubbornfood residue and cleaning hard-to-reach areas, such as the bowl door track. - Wipe away any residue with a clean, damp sponge or cloth. To clean exterior surfaces of the PortionPro Rx, wipe with a clean, damp sponge or cloth. Dry all PortionPro Rx components thoroughly before use.